At special weekends so we have troubadours who come here and play everything from Irish to creedence, ballroom bands etc. 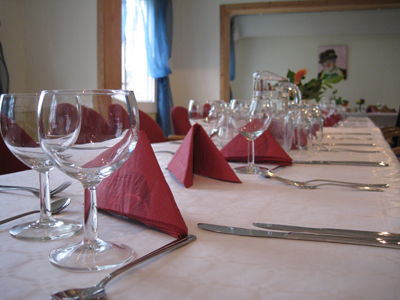 On Sikhalls Camping, we have a fully licensed restaurant serving good food or just a refreshing beer. The restaurant started as fast-food restaurant with hamburgers, hot dogs and French fries. Now we have expanded the menu with meat and fish dishes and an a la carté menu.